Petroglyph means rock carving. The word has its origins in the Greek language. Petros means "stone" and glyphe means "carving." Petroglyphs are rock carvings (pictures and symbols) made by prehistoric people. Some of the oldest petroglyphs in the world were found in Europe – symbols of glacial age animals carved into caves more than 10,000 years ago. In the Hawaiian language, petroglyphs are called ki'i pohaku – ki'‘i meaning "image" or "picture" and pohaku meaning "stone." 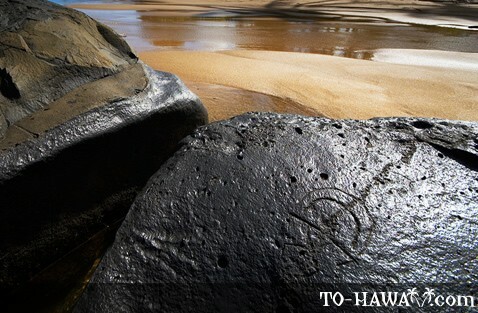 Petroglyphs can be found on all Hawaiian islands, in more than 100 different locations. 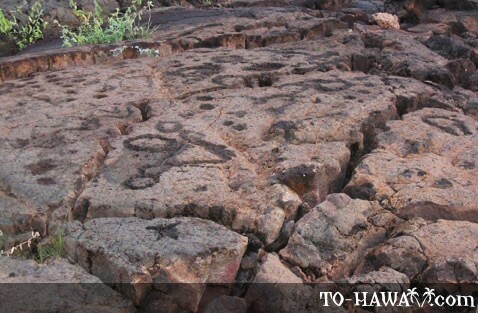 The largest concentrations of petroglyphs can be found on the Big Island of Hawaii. A few locations are within easy reach. Others are located on private property and permission may be required to see them. Located in the Hawaii Volcanoes National Park on the southern side of the Kilauea volcano, Pu'uloa features the largest concentration of petroglyphs in all of Hawaii (more than 23,000 images). It is located near the ocean near the end of Chain of Craters Road. From the pullout parking area, it is a 0.7-mile (1.1 km) walk. Pu'uloa means "long hill" in Hawaiian, but is also thought to be a place of longevity. Because of that, people used to leave a baby’s naval cord (piko) here to give the child the best chance for a long life. Images that can be seen here include holes, circles, human representations, canoe sails and feathered cape motifs. This is another large petroglyph site, located in South Kohala near Holoholokai Beach Park. The nearby Mauna Lani Resort at Kalahuipua'a gives out an informative brochure and area map to visitors and helps protect the area from damage. To reach the petroglyps, drive to the end of Mauna Lani Drive (2.4 miles from Highway 19). The entrance to the Holoholokai Beach Park is on the right. Take the Malama Trail and walk for 0.7 miles (1.1 km) to reach the petroglyphs. There is an elevated viewing area and a trail leading around an enclosure, where most of the rock carvings are located. The petroglyphs at Puako are believed to be some of the oldest on this island because most images feature linear or stick figures. One of the images here shows 30 men above the shoulders of another. Some of the other drawings show soldiers (koa) wielding various types of weapons. Located about 4.5 miles south of Puako, this petroglyph field is near the Waikoloa Beach Resort. About half a mile from Highway 19, there is a parking lot at King’s Shops. Visitors can pick up informational brochures and maps there or at the Royal Waikoloan and other nearby hotels. The petroglyphs are located next to the golf course. It is one of the best places to view these ancient rock carvings because this location is within easy reach. Images that can be seen here include human forms, circles, canoes and other abstract shapes. This site is located on the grounds of the Kona Village Resort. The petroglyphs here are unique compared to other locations, suggesting that Ka'upulehu was dedicated to special purposes. Also, many of the carvings depict sails, which might indicate that a sailing/navigation school was once located here. 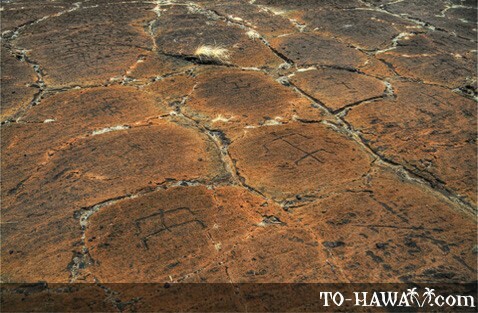 To view the petroglyphs, visitors need to make a reservation at the Kona Village Resort (they offer guided tours for the public). Located at the Kaloki Honokohau National Historical Park, this site features some younger carvings, including an image of a full-rigged ship. The park is accessible by turning off Highway 19 next to the exit to Honokohau Harbor. A visitor center in the park provides maps to visitors. Interpretive displays are located here as well. There is a short trail that leads from the Honokohau Small Boat Harbor to Honokohau Beach, which passes a petroglyph field. This is another site that’s easily accessible, located about 5 miles (8 km) south of Kailua-Kona. However, it is best to come here during low tide because the petroglyphs are located at a lava flat that is underwater during high tide. Images that can be seen include a wide variety of human figures along with phallic symbols and other abstract designs. The carvings are located about 200 yards (183 m) south of the park pavilions. Nearby is the Keeku Heiau (on the grounds of the Keauhou Beach Hotel), where Maui’s chief Kamalalawalu was sacrificed after being defeated. A petroglyph depicting him is visible at low tide (located at the southwestern end of the Keauhou Archaeological Complex). Petroglyphs can be seen on Haleakala, Lahaina, Kahoma and southeast Maui along Waiohonu Stream. 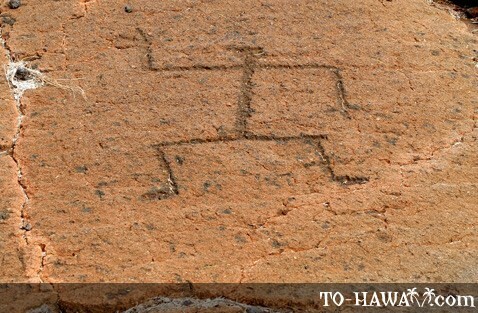 Another collection of petroglyphs can be found at Olowalu, which were carved into a cliff face. This site is quite popular and as such, has experienced vandalism in the past (like some other locations as well). To reach Olowalu, drive south on Highway 30 toward Kahului and look for the Olowalu General Store (at Mile Marker #15). Behind the store, take the dirt road toward Olowalu Valley. About a quarter mile down the road is a large pile of rock on the right. Watch out for a faded red handrail and an old staircase. The petroglyphs begin near the ground and continue along the ridge to about 60 feet above the ground. Some rock carvings can be viewed at the Nu'uanu Petroglyph Park, located along the western side of Nu'uanu Stream at Nu'uanu Memorial Park. The carvings here may have been inspired by the ghost dog of Nu'uanu, called Kaupe. The Koko Head petroglyphs are difficult to access because they are carved into the floor of a sea cave, located between Hanauma Bay and the Blow Hole. To see them, one must climb on slippery rocks. A petroglyph site on this island is located at Koloa Beach at Mahalepu. Curiously enough, all the figures carved here are said to have their heads look toward the sea. Another petroglyph site is located at the mouth of the Wailua River, below the temples of refuge. Petroglyphs can be found in many locations on this island, but most of them are located at Kaunolu and Luahiwa. Here, one can also see that site selection played an important role, as the boulder Keaohia features many drawings, while surrounding boulders are bare. Many of the images here seem to depict birds and seem to have something to do with local mythology of the man-eating bird, Halulu, after which the island’s most important temple site, Halulu Heiau, is named. 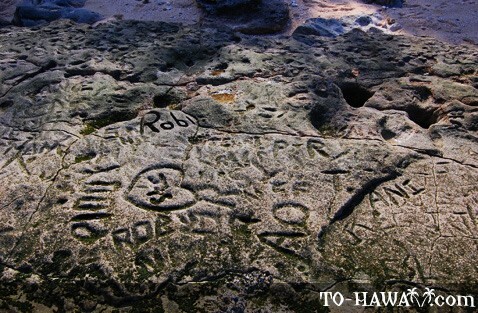 Petroglyphs can be seen in a small shelter near Ka Ule o Nanahoa, the popular phallic rock, which is located in the Pala'au State Park on Molokai’s north shore.